Seasonal Occurrence: Increasingly common throughout the year, but lesser numbers in winter. Breeds in our area. Profile by Richard Gibbons: The Black-bellied Whistling-Duck is a large duck with a long neck, long legs, and short tail. They have a chestnut breast and black belly with a bright pink bill and legs. Their face is gray and has a broad, white wing stipe that is visible in flight. True to their name, these ducks do have a whistle for their call. 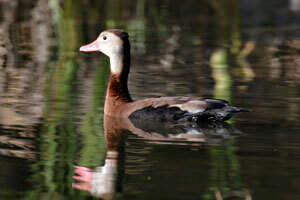 Black-bellied Whistling-Ducks hang out by shallow ponds, gold courses, city parks, and schools. Their ability to adopt human-altered habitats has helped them move north into the southern United States. Black-bellied Whistling-Ducks mostly eat plants such as smartweed, grasses, swamp timothy, sedges, and agricultural crops. Occasionally they eat smaller aquatic animals like snails, insects, and spiders. They usually forage at night in fields or in shallow ponds. Because of their long legs, they spend more time than other ducks walking around on land or perching in trees. They are gregarious throughout the year and form flocks of up to 1,000 birds. They form lifelong pairs and breed during the first year of their lives. The males spar by chasing each other and using a threat display. 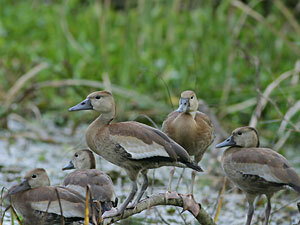 Pairs usually form in winter and the females often lay eggs in the nests of other whistling-ducks. They usually nest in tree hallows, but have been known to use nest boxes and nest on the ground. Interestingly enough, they do not typically build a nest. Instead they lay their eggs on whatever is already in the location they chose. The eggs are white and there are typically 9-18 eggs in a clutch. Black-bellied Whistling-Ducks have been expanding their range in the southern United States. We have seen some checking out our new addition to the rookery in Smith Oaks.